Yes, indeed! Quebec is such a quaint city full of so much character. Oh, and tourists. Definitely full of tourists. But for good reason! A visit here is like visiting a really old, quaint town in Europe. Specifically, France, as everyone in Quebec speaks French. There’s the cobblestone streets, the European-style buildings with flower boxes hanging from the windows, a beautiful castle, old cathedrals, street performers, enticing cafes and bakeries, large squares, and ramparts surrounding all of it. My time in Quebec City with my Aunt Georgann started with a drive from Montreal where we had been staying for a few days. We arrived in the city just in time for rush-hour traffic, which apparently cannot be escaped no matter where one travels. We finally made it to our Airbnb accommodation around 5:00 (more on our accommodations at the end of the post) and dragged our heavy suitcases up three flights of stairs. I was sweating like a fiend after that grueling workout! First order of business after settling in a bit was to find some dinner. We had planned on just getting something cheap and light, but of course, after walking past amazing-looking restaurant after amazing-looking restaurant, most with pretty reasonable table d’hote menus, we decided to just eat a full dinner. We ended up at l’Omelette, which was pretty casual and had decent food. It had been raining most of the day so we both decided it would be the perfect time to have some French onion soup! It was delicious and ended up being the highlight of our meal. Back to our apartment and to that music I mentioned in my journal entry. We were visiting the city during the Festival d’été de Québec, an annual music festival that takes place at various locations throughout the city. One of those locations is the Bell Stage: the largest free-standing stage in North America, and located near enough to our apartment that we could hear the live music each evening. I so enjoyed lying in bed with the windows open listening to the live music! Or listening while sitting on our little balcony with my computer and a French pastry. 🙂 The first night we were there, the featured concert was a folk rock band I had never heard of but really enjoyed; my second night I got to hear The Killers (so exciting! ); the third night was electro bands (pure torture); and my final night in the city was Queens of the Stone Age (eh). Our first day in Quebec was short and sweet and we were very much looking forward to exploring more of this city during the next few days! 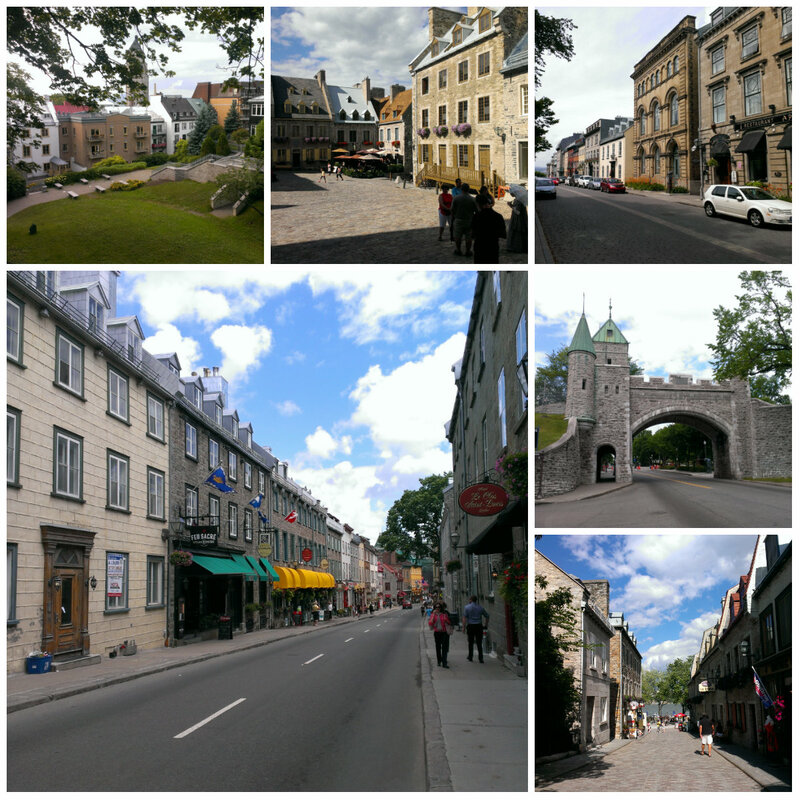 As with all of the places we stayed at while in Canada, we booked our Quebec accommodations through Airbnb. 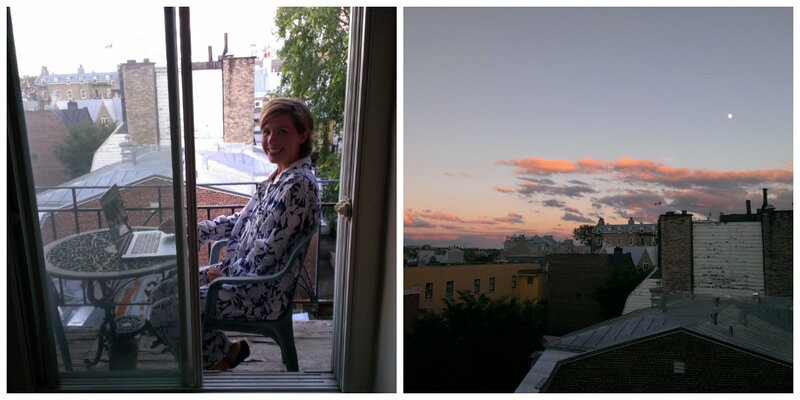 We stayed at Vivienne’s apartment right in the heart of Old Quebec, only two blocks from the Château Frontenac. The apartment is located on the top floor of a very old building and was just full of character! It’s not fancy by any means but I honestly wouldn’t stay anywhere else if I visited again. Vivienne was so sweet and accommodating and just a genuinely friendly person. My favorite part of the apartment was the little balcony just off the bedroom where I slept (my aunt slept on the sofa sleeper in the living room which contained the only A/C unit in the apartment 🙂 ). Anyway, I highly, highly, recommend Vivienne’s place for a truly authentic experience staying in Quebec. While Georgann and I did drive into Quebec, I really wouldn’t suggest bringing a car here. First, you don’t need it if you’re just hanging out in the Old City. Second, parking said car is going to cost you a decent amount of money. We walked everywhere and it was lovely – even walking outside the old city walls a few times. There are soooo many restaurants in Quebec and all of them look fantastic!! 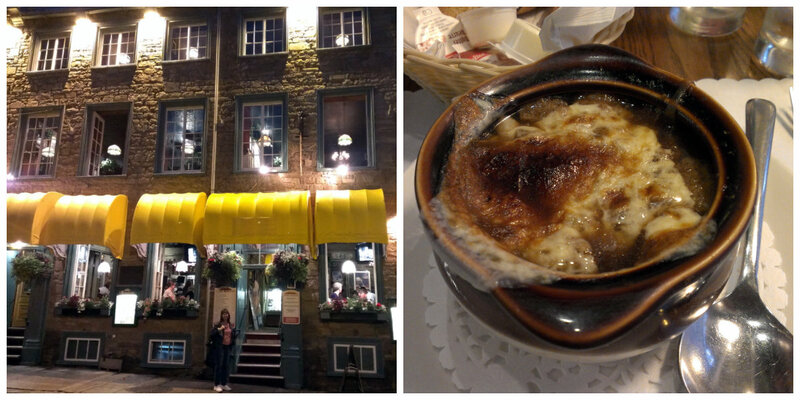 I even devoted an entire blog post to the restaurants I ate at while in Canada! It was so hard deciding each evening where we were going to eat. I suggest 1) going with what fits your budget (table d’hote menus are the way to go there), and 2) ask for recommendations from locals – three out of the four restaurants we dined at were recommended to us and they were the best three restaurants we ate at.